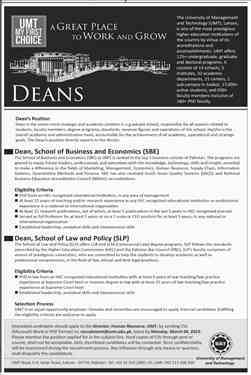 University of Management and Technology is a well-known private university of Lahore. It is honored as the leading schools in Pakistan for business. It does not have extremely higher fees. It was founded in 1990 by the ILM Foundation. Within the passage to two decades, it has built its name for education and research in Pakistan. There are infinite educational programs of the students which are provided by the university. It has extremely large campus with is the equipped with the excellent information technology facilities. It has also another campus in Sialkot which is an industrial city of Pakistan. Administration of the university has increased the security for the safety and protection of the students and overall staff. Education provided to everyone is of exceptional quality. Scholarships are also provided to the genius students. University of Management and Technology is a leading employer in Pakistan. It hires every kind of professional and fresher according to the job requirement. Some of the academic positions at the university requires higher CPGA or grades. Competition for jobs at University of Management and Technology is exceedingly high. Students who have completed their education from the university also apply for the employment. Human Resource Management shortlist the applicants. Candidates have to apply for the vacancies with their CVs and portfolios. They have to demonstrate their previous work experience by multiple mediums for getting the jobs. Those who can easily illustrate this are selected for the jobs. ilmkidunya is the biggest of University of Management and Technology Jobs. The people who are applying for the jobs can view them below.